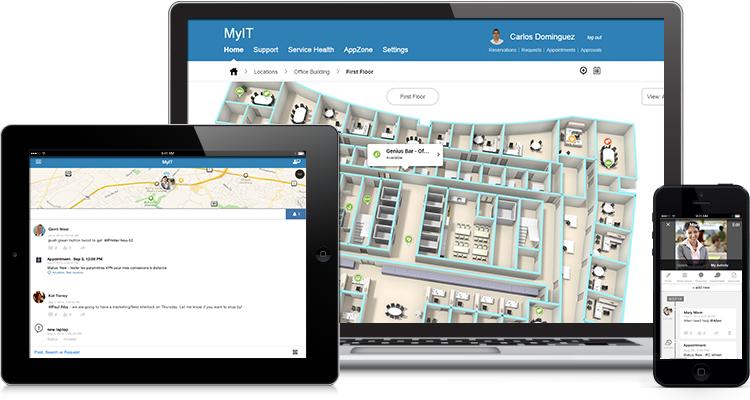 Work smarter with context-aware IT services - MyIT is a new self-service app that uses location, role, and preferences to guide employees to the answers and tools they need here and now. Modernize your business with formless requests, context-aware services and crowd-sourced collaboration. Improve employee productivity by reducing time wasted on technology-related issues. Cut support costs by deflecting level-one calls to the service desk. Let an amazing user experience boost customer satisfaction. Deflect routine help desk calls to decrease the cost of high-priority tickets by 33%. Cut IT-related downtime by 25% by connecting business users to IT services anywhere, anytime, on any device. Find more time and resources for critical IT transformation projects. Use across iOS, Android, or any device with an HTML5 browser. Combine MyIT and Remedy with Smart IT to set a new service desk standard for the modern workplace.